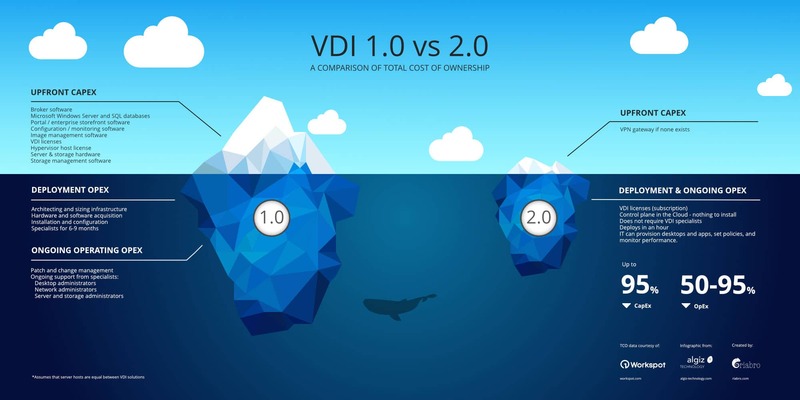 When you need to get a simple but dramatic point across about the cost of VDI, you can always rely on that IT industry favourite – the iceberg infographic! We’ve worked with our partners Workspot to show you how ridiculously different the cost of older VDI 1.0 solutions from the likes of VMware and Citrix are, compared to Workspot’s next generation VDI 2.0. So why the difference in cost of VDI 1.0 vs. 2.0? With VDI 1.0 you have huge upfront CapEx costs from software licenses. Then during the deployment phase, OpEx costs mount up because of the need for VDI specialists working for anything between six and nine months simply to architect and install the solution. OpEx continues to increase because of the administrative cost of needing many different IT specialists to maintain the system. With VDI 2.0 you immediately eliminate most of the upfront CapEx cost of licenses because these are now part of OpEx. And because Workspot’s VDI 2.0 solution can be delivered incredibly quickly (we’re taking hours and days, not months or years), the specialist skills and cross team support costs plummet. This infographic is a visual snapshot of the cost of VDI. Find out more about VDI 2.0 and get an in-depth analysis and comparison in the whitepaper “Comparing TCO: VDI 1.0 vs. 2.0“.